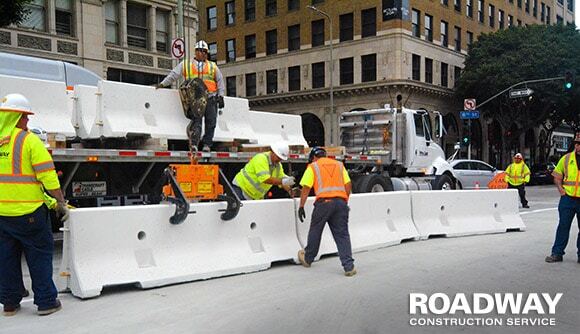 Traffic barricade rental is critically important to every highway traffic management company serious about work zone safety. But barricades don’t work alone; they must be integrated into a traffic control plan. For this reason, Roadway Construction Service doesn’t just deploy traffic control barriers. We integrate them into a complete system specially designed for each project. Effective traffic barrier rental begins with the barriers themselves. For every project tackled by our team, we implement a full range of barriers strategically deployed to maximize safety and the orderly flow of traffic. Jersey Barriers (a.k.a. K Rail Barriers). Essentially a wall of super-sturdy muscle, Jersey barriers perform multiple functions. The most common of these is keeping road traffic out of closed lanes. K rail also helps to re-direct traffic flow and maximize the safety of nearby pedestrians. Because of its strength requirements, k rail often is filled with concrete to provide necessary muscle, stability, and rigidity. Water-filled k rail also is available for roadway construction projects. Whether in the form of water-filled barricades or concrete road barriers, nothing exceeds the formidable brawn of Jersey barriers. Strength isn’t the only feature of these traffic management barricades. Jersey barrier also displays high visibility, providing plenty of advanced warning to drivers. To ensure maximum visibility, k rail often is brightly colored in vivid hues such as orange. Road traffic control devices support the job performed by traffic control barriers. The most commonly utilized of these are the oft-seen traffic signs. Virtually everyone, driver or pedestrian, is familiar with traffic management signs, which generally offer necessary directions such as slow down, stop, or go. Other types of road traffic control devices include variable message signs, high level warning devices, and channeling devices. This last group includes road construction barrels and traffic control cones, which are deployed to guide passing vehicles through narrowly-defined routes. Often, cones are made of shock-absorbing plastic to minimize vehicle damage should unintended bumping occur. While vehicles are the primary focus of traffic management barricades, these protective barriers are sometime called into action to supply an effective crowd-management solution. This type of barricade is indispensable for maintaining order at stadium events, parades, and in other densely-packed settings. For such situations, clients can rely on Roadway Construction Service to provide the industry’s most reliable crowd control barricade rental. All the road traffic control devices and traffic control barriers in world are ineffective without the heroes of the road – traffic control flaggers. Combining hawk-eyed powers of observation with skillful communication, flaggers are essential for the safety and efficiency of well-traveled work zones. Roadway Construction Service is proud to say that our flaggers are trained to the highest safety standards. It is no exaggeration to say that this highly-qualified team is vital for the protection of work crews and the public. Are you looking for proven traffic control solutions? 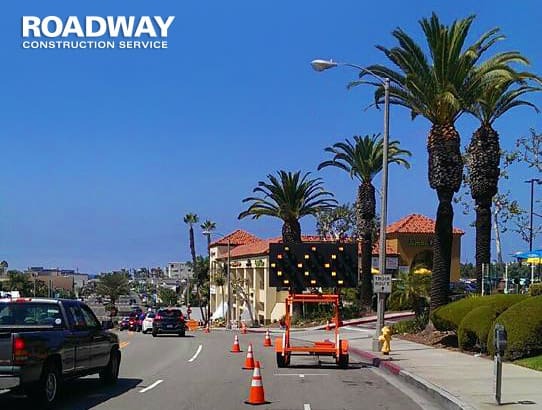 Count on Roadway Construction Service for the best in traffic barricade rental services. To learn more, contact Roadway Construction Service for additional information about our industry-leading solutions and competitive rates.